So, tardy to the party as ever, but today is World Poetry Day. I'll admit, I haven't read much poetry since I left school almost ten years ago. Even then, I was limited to whatever poets we were studying in English class. I did enjoy it, but I'd much prefer to pick up a regular book than a book of poetry. Which is a shame, as some poems are so beautifully written, I'm definitely missing out! I used to dabble in writing the odd poem or two in school, but I'd rather not relive the time I wrote one for my maths teacher. I don't think I'll ever live that down! Lets just say the phrase "big is beautiful" was meant to be about our graphs.... Instead, I thought I'd share this little book of poetry that my grand uncle had published a few years back. 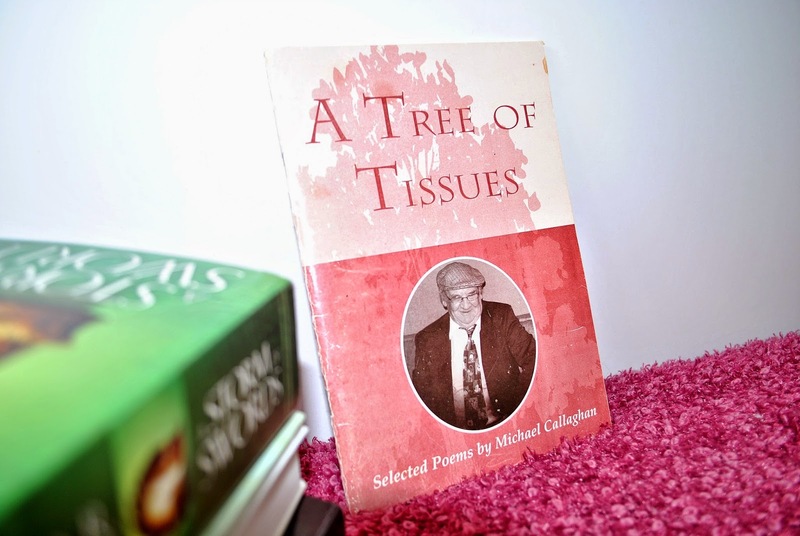 "A Tree of Tissues" is a collection of poems by Michael Callaghan, Mickey to family and friends. Mostly written for his wife and family, I laugh and cry my way through this little book. Dedicated to the memory of his wife Nellie, he was encouraged by his children to collect his favourite poems together to form this book. Mickey writes with affection for his family, friends and wildlife. He pens with a firm faith in God, but can also produce a cursing poem that packs quite a sting. His poems of emigration ring true, as do his lighter, comedic, pieces. But I could not find one made of silk With the colours of the rainbow. Nor one that sparkled like the stars With the beauty of an emerald. But in my heart there is a box And for forty years you have filled it; And if I live for forty more You will find three words within in- I love you. A journey through life, Has many a bend, And at times one may feel They are lost. But there isn't an atlas That one can buy, To guide them to the right path. It is what you take with you From the time that has passed, That will help you To find the sure way So take your manner and grace You have shown in the past And you surely will not go astray. Wow. What a great keepsake. I can imagine how much it means to read it.